The Washington Corporation is currently using first-in, first-out (FIFO) method of inventory valuation. The president wants to know the effect of a change in inventory valuation method from first-in, first-out (FIFO) to last-in, first-out (LIFO) method. A physical count was made on December 31, 2016 and 16,000 units were found in inventory. The total operating expenses of $400,000 were paid during the year 2016. Required: Prepare a comparative income statement using FIFO and LIFO method for the president of Washington Corporation. 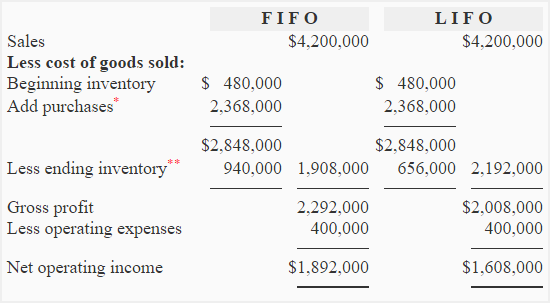 Notice that the gross profit and net operating income under FIFO is higher than LIFO. When prices of the goods rise, FIFO usually produces higher gross and net income than LIFO.